Compassion literally means to suffer with, to suffer together, to share in the suffering. If you want to understand real compassion for refugees, look to Israel. In the 1950s, Israel took in the Mizrachi Jews of the Middle East at a time when the country did not have enough food for everyone to have three meals a day. Compassion literally meant going hungry to absorb refugees who had lived in their homelands for a thousand years and were thrown out in a virtual single night. Contrast that with the virtue-signaling liberals denouncing President Trump’s refugee policy. What suffering are they going to incur in order to absorb people who largely are not refugees in any legal sense but rather economic migrants? The answer is simple. None. These middle-class liberals will not be competing with the economic migrants for low-skilled jobs. Their leafy upscale suburbs will not see a migrant unless they are there to sweep the floors, manicure the lawn, or bus the dishes in an upscale restaurant. Their classrooms will not be overcrowded. Their schools will not have to shift resources to accommodate students who cannot speak English, and in some cases cannot speak Spanish but speak an indigenous language for which there are no translators. Their parent-teacher nights will be well attended, whereas parents working long hours at manual labor and lacking language skills do not attend parent-teacher night. They haven’t the time, energy or money to help fill a school’s resource voids, as middle-class parents routinely do through volunteering and opening their pocket books. Their communities will not face the impact of a group of unskilled, impoverished migrants with a different set of cultural values. 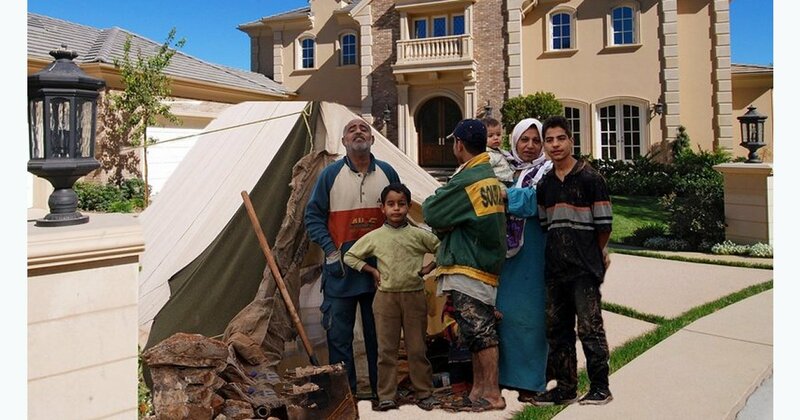 As Victor Davis Hanson of the Hoover Institution notes, the central valley in California is littered with junk from illegals who have no respect for the land because their socialization is different. The false middle-class compassion enables the Mexican oligarchy to maintain the status quo by exporting its poor and exploiting their economic remittances. Mexico, with its pass-through of Central American and Mexican immigrants, controls our immigration policy – even legal immigration. The ceilings on legal immigration are influenced by the vast number of illegals. The liberals of Dobbs Ferry, New York will signal compassion for economic immigrants but will not see emergency rooms close or their county health facilities flooded with illegals to the point where the signs are now in Spanish. We have an elite that has immunized itself from the problems its policies visit on ordinary Americans and a middle class that loves illegals while it feels nothing for America’s poor and homeless. If it did, it would ask the inconvenient questions about how allocating resources for illegals depletes those available for America’s impoverished citizens. Israelis gave up a meal a day to absorb the Mizrachi Jewish refugees while straining its fledgling economy. That is compassion. Middle-class compassion in America causes America’s poor to experience economic hardship so that the middle class can feel virtuous while denouncing President Trump. If we want real immigration reform, let’s locate refugee resettlement areas in upscale middle-class neighborhoods. Establish public housing for immigrants in those neighborhoods and open the institutional facilities of those neighborhoods to the immigrants. And if that isn’t enough, recruit professionals from Mexico and Central America and license them to compete with America’s professional class. Then we’ll see how compassionate and virtue-signaling middle-class liberals really are. Abraham H. Miller is an emeritus professor of political science, University of Cincinnati, and a distinguished fellow with the Haym Salomon Center. This article originally appeared in The Daily Wirer and is reprinted by permission of the author. If Hillary Was A Man, Would People Still Vote For Her? Join the Rockit News Mailing List!